I absolutely love the dollar aisle at Michaels and Target because sometimes there are fabulous little surprises that are perfect for crafts! Earlier this week when we were in line and I was feeling kinda crazed because the kids were on a verge of a meltdown, I saw these rings of chipboard and knew we'd be making lots of things with them... so I grabbed several! 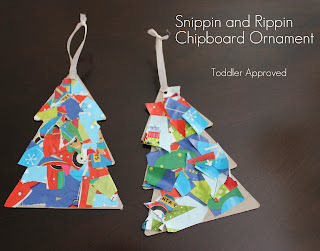 First up are these little rippin and snippin ornaments created with leftover wrapping paper. The youth from church shopped and wrapped presents for a local Angel Gift program on Wednesday night and I snatched all the leftover wrapping paper scraps before they got tossed. I am so glad that I did! Materials Needed: glue, chipboard ornaments (or cardboard cut outs), scissors, paint brush, wrapping paper, and ribbon. I was watching a friend's two kids this morning while my son was off at his Mom's Morning Out program, so when the 2 babies napped, the 2 yr old little girl and I crafted! It was lovely. My favorite comment of the day was when she told me how much she loved my dress (meaning shirt). We just chatted about our favorite colors and things while we snipped. It was adorable what a chatterbox she was. 1. Snip the wrapping paper into various sizes. 2. Paint with glue all over the ornament.. you can add multiple layers on top of the paper to cover everything. You could also use modge podge for this. 3. Stick the wrapping paper on. You can this on any of the shapes... by my little buddy liked trees the best. 5. Stick a piece of ribbon through the punched hole at the top and tie a knot. Your ornament is ready for hanging once it is dry! Do you have any other favorite ornaments you have created? If you haven't already, head on over to Day 2 of the Creative Christmas Countdown at Dilly-Dali Art. There is a beautiful advent activity she is sharing with you! Also, if you entered the ZipBin giveaway... we have a WINNER! Congrats to lucky2dreamer! Check your inbox. I just sent you an email! So cute! I'm gonna have to visit my local Target to see if we have those chipboard rings, love their 1$ section! Pretty ornaments! I am glad you saved the wrapping paper and put it to good use. My daughter loves to cut paper into tiny pieces. This might be the perfect toddler/young preschooler ornament craft! My two year old loves ripping, cutting and gluing. Can't wait to try this! I loved these ornaments! I am definitely doing them for Christmas! Thanks for sharing! Always looking for creative ways to reuse wrapping paper and Christmas cards! Love this!